Why Choose Us? 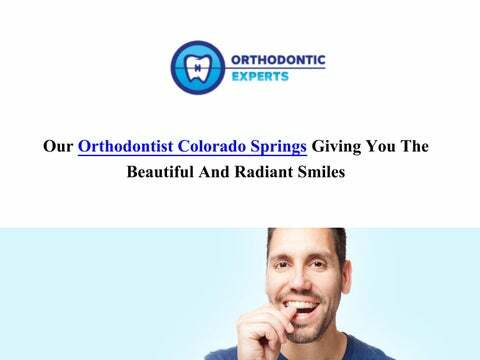 o Our Orthodontist in Colorado Springsâ&#x20AC;&#x2122; mission is to provide the highest quality life time dental care and comfortable environment. o We are confident that our services and friendly staff will exceed your expectations and make you feel right at home. o We uses the latest technology including digital X-rays, digital 3D dental models, and much more. o We can help design the perfect treatment plan for everyone. Best Braces in Colorado Springs! Traditional Metal Braces: Traditional braces are made from stainless steel brackets attached to your teeth surface with an adhesive. The metallic brackets are connected to each other using archwire and elastic. Ceramic Braces: Ceramic braces look like the traditional metal braces. These braces require thorough oral hygiene since the ligatures are susceptible to discoloration. Lingual Braces: Lingual braces look like traditional braces. These dental braces are designed to match your teethâ&#x20AC;&#x2122;s shape and size. Invisalign in Colorado Springs!  Invisalign treatment is not painful when compared to brackets and wires.  Wearing and removing the aligner trays feel really comfortable.  Patients can always enjoy the food they like without any problem.